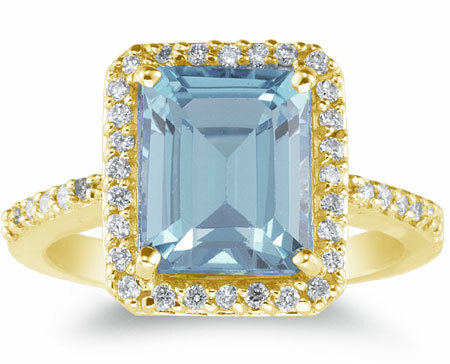 Apples of Gold Jewelry presents a cocktail ring that will shine, sparkle, and dazzle both you and your guests with this large 2.70 carat emerald-cut ice blue aquamarine and diamond ring in 14K yellow gold! Surrounded by 38 diamonds which total 0.38 carats and are rated H-I for color and SI for clarity, this generously sized, A rated 10mm x 8mm aquamarine gemstone ring will have you turning heads at every party! The soft, pale blue of the gemstone will remind you of ice crystals and snowflakes every day of the year! We guarantee our Large 2.70 Carat Emerald-Cut Aquamarine and Diamond Ring, 14K Yellow Gold to be high quality, authentic jewelry, as described above.